Museums and gallery interiors are designed not only to showcase works of art but to enhance the visitor experience. 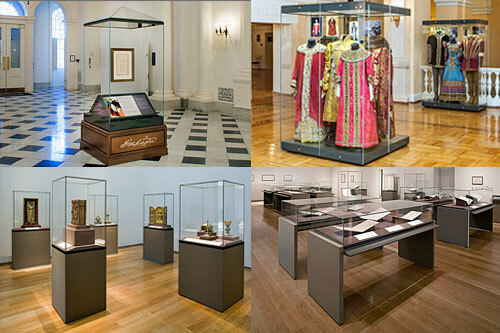 We offer simple, unobtrusive stanchions and wayfinding accessories uniquely purposed for the safety of collections and visitors alike. These low, unobtrusive stanchions are an indispensable resource in museums, galleries and public spaces where art is displayed. Elastic cord stretched between vertical post and base prevent visitors from getting too close. For those areas where a physical deterrent is required, our 36" tall stanchion provide an understated barrier at hip height distance ideal for restricting access or defining circulation in public space. This unobtrusive barrier system provides an elegant means to address crowd control in high traffic areas. Elastic cord stretched between vertical posts can easily direct and inform queuing visitors. Adapted for outdoor environments, these barriers can be planted in the ground to restrict visitor access to monuments, art installations, sensitive plantings and other landscape hazards on public grounds. Elastic cord is used with all our gallery products and is available in four standard colors.